There comes a time(s) in every pregnancy when you know your body just needs a good massage. It can be a daunting process, trying to find a pregnancy massage therapist that you can trust and feel comfortable and confident in during this precious time in your life. Word of mouth or a personal recommendation is always a good place to start, but even then you will want to do a little further research and enquiry for your own satisfaction and peace of mind. 1. What specific pregnancy massage training they have done in addition to a diploma of remedial massage? A diploma of remedial massage is a fantastic foundation, but massage therapists really need more specific training for pregnancy massage. At the moment Nurturlife Practitioner Training is the only specific pregnancy massage training offered in Australia, that I am aware of. This training teaches the specifics of positioning and massaging pregnant bodies, when not to massage, and how to accommodate various ailments and conditions experienced during pregnancy. 2. Which Australian massage association are they currently registered with? Are they registered with health funds in order to make a private health insurance claim? In order to claim rebates from your private health insurance for massage, therapists need to hold current professional membership with an eligible Australian massage association. This fact indicates that the therapist is maintaining their continuing professional education (CPE), has a current senior first aid certificate, and holds professional indemnity and malpractice insurance. You can even contact the said association directly to ensure they have their registration up to date. A Word of Caution: We can never assume that a massage therapist or well known establishment advertising that they provide pregnancy massage is specifically trained to do. The massage industry in Australia is currently self regulated, meaning there is no one actually enforcing compliance. So ultimately anyone can say they do just about anything and there are no repercussions, except in the event that something goes wrong and someone is injured. 3. 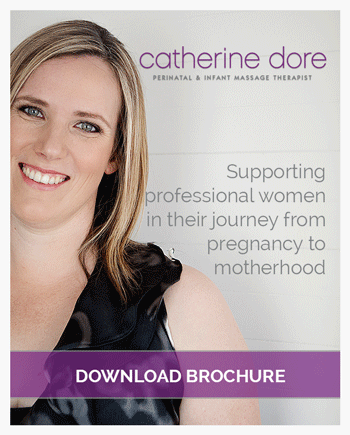 How do they position pregnancy clients for pregnancy massage? This is really crucial. Side lying, seated or semi reclined are the best and safest positions for massage during pregnancy. All areas of the body can be treated via these positions whilst maintaining comfort and safety for both you and your baby. An experienced & responsible pregnancy massage therapist will know this. The cushion systems and massage tables with the hole cut out that enable you to lay face down on your stomach are not advisable. Firstly it means that the therapist does not necessarily need to change/adapt or seek further training in relation to pregnancy, they will usually apply the same massage techniques and pressure that is applied to a non-pregnant person. Secondly these systems rarely accommodate or support each belly adequately, leading to unnatural and unnecessary pressure points directly on or around the belly and also adding strain the ligaments of the lower back. Also a specifically trained pregnancy massage therapist is educated about various pregnancy conditions, tests and events that can occur for which massage would not be advisable. Finding the right pregnancy massage therapist is very important. It is absolutely worth doing your homework on this. The idea of massage during pregnancy is to reduce your stress levels, not increase them. Take a load off your mind by ask these simple questions, then you will feel completely confident, comfortable and relaxed in having your chosen pregnancy massage therapist take care of your body as your baby flourishes and grows. I also advise that you check with your Doctor, Obstetrician or Midwife whether massage is appropriate for you, they may even recommend a pregnancy massage therapist to you.